Makars’ Court is an evolving national literary monument where you can see some of the famous words of great Scottish writers inscribed in the flagstones. The Scots word Makar means ‘one who fashions, constructs, produces, prepares, etc.’ (Dictionary of the Scots Language), and in a literary context it is the role of the poet or author as a skilled and versatile worker in the craft of writing. We have many such folk living in Scotland, and to celebrate the importance of writers in our lives, in this City of Literature, Edinburgh has adopted its own version of the Poet Laureate: the Edinburgh Makar. Look out for quotes ranging from the 14th century John Barbour to Dame Muriel Spark who died in 2006. New flagstones are added on a regular basis. Makars’ Court is in Lady Stair's Close, just off the Lawnmarket section of the Royal Mile. Walk down from the Castle, pass Gladstone’s Land on your left, and you will see on your left the narrow close marked ‘Lady Stair's Close’ that takes you into Makars’ Court. Exit Waverley Station onto Waverley Bridge and turn left. Cross near the roundabout and go up Cockburn Street. At the top of Cockburn Street, turn right onto the Royal Mile and continue on past George IV Bridge and Deacon Brodie’s pub. About 100 metres on from Deacon Brodie’s on the right hand side of the road is Lady Stairs Close. Go down the close and you’ll see The Writers’ Museum with Makars’ Court outside. There are no parking facilities at Makars’ Court. ‘Pay and Display’ on-street parking is available nearby. The monument is outdoors and accessible to pedestrians at all times. No booking required as this lives in a public space. Makars' Court is situated next to The Writers’ Museum and is easy to find, just off the Lawnmarket, the top part of Edinburgh’s historic Royal Mile, in Lady Stair’s Close. 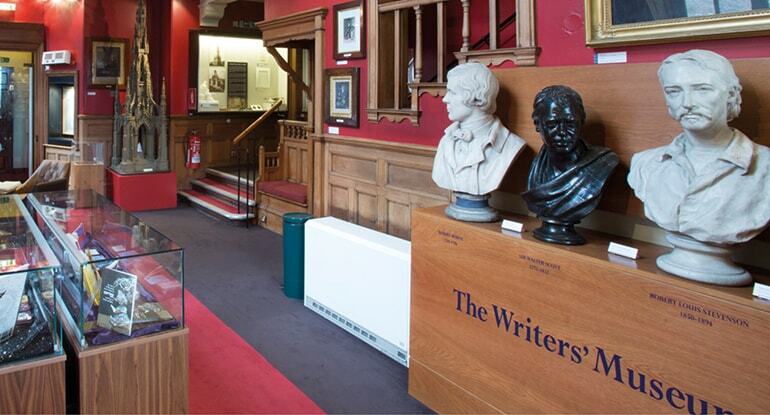 This ongoing project to celebrate the lives and works of Scottish writers was conceived in 1997, growing out of a desire to broaden the remit of The Writers’ Museum and coinciding with the International Conference of PEN (Poets, Essayists and Novelists) which was being held in Edinburgh that summer. Selected by the Saltire Society, the first twelve writers and quotations were sponsored by Lothian and Edinburgh Enterprise Ltd (LEEL) in association with the City of Edinburgh Council. The first stone, dedicated to the fourteenth century poet, John Barbour, was unveiled in 1997 by Ronald Harwood, President of International PEN. In 1998 the next eleven stones, representing Scotland’s main literary languages - Scots, Latin, Gaelic and English - and ranging in date from Robert Henryson to Sorley MacLean, were unveiled by the poet Iain Crichton Smith. Each of the writers is commemorated by a quotation inscribed in stone and set in the paving leading from both The Mound and the Lawnmarket to the door of The Writers’ Museum. The project was designed and implemented by Carter McGlynn, Landscape Architects. The original twelve stones were carved by David Lindsay and Graciella Ainsworth. All subsequent stones have been carved by David Lindsay of Stoneworks. The enamel panel on the north wall of The Writers’ Museum, overlooking Makars’ Court, was designed by Kathleen Gibson and incorporates bas relief profiles, by Tim Chalk, of Robert Burns, Sir Walter Scott and Robert Louis Stevenson. Download our comprehensive access guide to find out how you can get to and around Makars Court.